Hello! Welcome to The Cookie Scoop, where you'll get your fill of all things cookie. My name is Susan and I am the founder/official cookie lady of Bucks County Cookie Company. I am the proud mother to two wonderful sons and we all live in Bucks County, Pennsylvania. 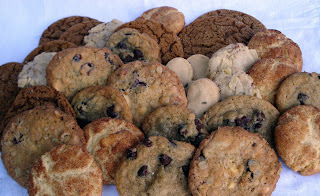 I started my company in early 2008 selling my gourmet cookies at local farmers markets. Today, almost a year later my cookies, brownies, blondies and scones are being sold in a few local markets here in Bucks County. I created this blog to record the journey of my cookie company, share recipes and hopefully interact with other cookie lovers. Also to bring a visual journey of beautiful Bucks County.